A complete illustrated owner’s manual and user guide to the 2018 Jeep Wrangler leaked over the weekend on JL Wrangler Forums. While Jeep’s reps have declined to confirm its authenticity, there’s very little doubt that it’s the real deal. Here are the most interesting facts and functions we found in it. The new “JL” body Wrangler will not only retain its LEGO-like modularity, but it looks like the windshield can be lowered very easily. While old old Jeeps had easy unscrew, knock-down folding windshields, the outgoing JK model required about two hours of labor and way too many Torx bolts to lower the glass. And once the task was complete, it looked dumb. But speaking from experience, I can promise that driving a Jeep glass-free is a riot and I sure hope more people enjoy it now that the process is a little less intimidating. It appears that some JLs will have essentially the same hardtop that current JKs can get; where the area over the driver and passenger can be removed separately to create a targa top-like situation. But in the new Jeeps, there will also be removable quarter-windows and, as an option, a power-sliding roof. The powered roof seems to be, basically, like an enormous old school sunroof. I think it will look something like the large retractable canvas center-section you might remember seeing on the Jeep Liberty (I actually thought it was the Patriot, but was thankfully corrected). But if you removed your doors, and your quarter windows, and rolled that bad boy all the way back, you’d have damn-near a “fully-open” Jeep experience without having to stash your roof someplace. 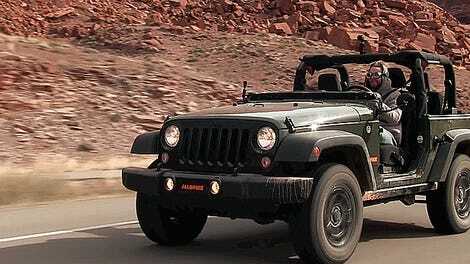 For maximum breeze, the Wrangler soft top you know and love will still be available. I can’t really tell if it’s going to be much easier to use than the current setup, but the “removal” instructions look pretty similar to what they are for today’s Wrangler. A line referencing power windows as “if equipped” tells us the bargain-basement entry level Wrangler trim will still come with crank-down glass, but the nicer models are moving upmarket. I saw a line in the book about an optional heated steering wheel, which would be like a gift from god on a cold morning camping out in Johnson Valley. The new Wrangler will have Fiat Chrysler’s latest infotainment software Uconnect 4 as an option, which will include some Wrangler-unique menu options. An “Off-Road Pages” set of menus within Uconnect 4 as fitted in a Wrangler will include some entertaining items like a tilt-and-pitch gauge, screens depicting suspension travel, and other impressive nonsense that’s fun to look at while you’re wheeling. Uh, fun for your passengers at least. Watch the rocks, not the blinking lights please. Like the Ford Raptor and Super Duty, the new Wrangler will get four “aux” buttons pre-installed in the dashboard with wiring running to nothing under the hood. That’s going to make installation of electrical accessories like lights very painless and clean-looking. If Jeep dealers are smart, they’ll start stocking up on LED pods and bars to roll into your financing package. Both the 2.0-liter four and 3.6-liter six will have the same tow ratings. The difference in capacity appears to depend on how many doors your Jeep has. Or, more practically speaking, how long it is. The two-doors will be rated to tow 2,000 pounds while the four-doors will be certified for pulling 3,500 pounds. Keep in mind, those figures do not apply to the diesel or JT pickup truck spec Wrangler. Both a four-position and a five-position 4WD transfer case are mentioned in the manual. 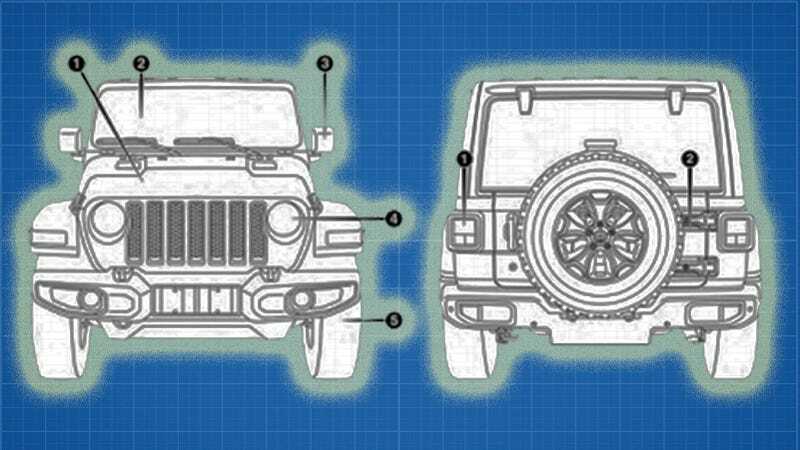 While the four-position will be the standard stick you’re used to using for going to low-range, with options for 2WD, 4WD High, Neutral and 4WD Low, the five-position will add a “4WD Auto” that will engage the front axle as needed based on the Wrangler’s traction control and stability detection stuff. The user guide lists suggested gear speeds for the six-speed manual transmission, but only for the 3.6-liter V6. I have a feeling that means Jeep’s not going to bother pairing the stick shift with the gas-saving 2.0-liter or supposedly later-coming diesel, but those do get an eight-speed automatic with an “AutoStick” +/- gear position override if you’re still compelled to try and shift yourself. It’s common for turbocharged engines to call for higher octane, and indeed, the new Jeep owners manual “recommends” 91 octane. Something to keep in mind if you’re buying the smaller engine to pinch pennies. I have a feeling Jeep’s representatives will be grumpy about us and other outlets talking about all these features before the new Wrangler’s real reveal slated for the Los Angeles Auto Show next month. But frankly, this leak has only added to my excitement about the Jeep’s big revision. A slightly upgraded V6 that retains the manual gearbox option plus those new aux-switches alone has me fired up, and the power hardtop and folding windshield sound like fun and accessibly accessories. Naturally, people will feel obligated to say “the last Wrangler was the last real Jeep” but from what we’ve uncovered so far it sounds like the new Wrangler is only getting refined in the right places.